I'm all about taking the long-cut. I'm a proponent of riding the wrong bike. And I believe you should do your best to run-what-ya-brung. Over the years, I've owned many bikes which have equipped me to practice these ideals, utilitarian bikes, which I've always purchased for never-more than fifty-bucks and often less, bikes with big heavy wheels, fewer-than-optimal gears, and often with fenders, racks, and large bags attached. The world sometimes calls this class of bicycle the "commuter" bike, which is an okay moniker, I guess, if you're after some sort of esoteric differentiation between what this-bike and that-bike can or can't do for you. But I prefer to just call them all bikes: fat-bikes, cross-bikes, singlespeed-bikes, downhill-bikes, whatever. They're all fine for getting you from A to B. They all deserve to be ridden. They're all fun. In the end, they're all just bikes. Nevertheless, of the many utilitarian bikes I've owned over the years, all of which have served me quite well, I've ridden at least three right into the ground, into a condition beyond repair, just because I rode them. A lot. As in nearly every day: in my youth I thoroughly destroyed an old JCPenney bike that I used for years to deliver the Scottsdale Daily Progress newspaper six days a week; I essentially crushed an old Mongoose ATB which I rode to and from work through the woods for 10 years and which got "the cancer" and broke at one of the rear drop-outs; and I put probably 10,000 just-around-town, back-and-forth, through-the-woods miles on a lovely celeste-colored, Biopace-equipped, lugged Bianchi Incline that was never meant to do such work and which, probably as a result, also got "the cancer" and eventually snapped one of the seat-stays. 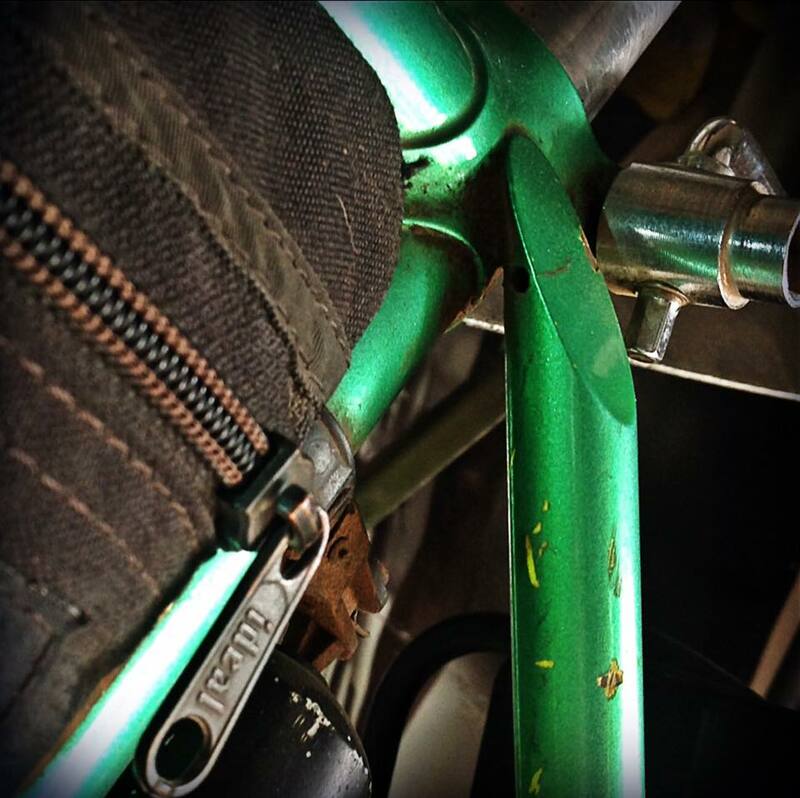 This 1987 lugged, Prestige-steel Panasonic Mountain Cat 7500, my current go-to, utilitarian "commuter" bike, currently has "the cancer," too, a stress-riser that derives from a breather-hole at the top of the seat-stays. Not a terminal condition at this point, but ya never know. Meantime, it's a great bike and has been for many years. I bought it maybe eight years ago for about forty-bucks at the annual FlagstaffBiking.Org Bike To Work Week bike swap event from my buddy Ken (not that Ken, however) who bought it new in 1987. 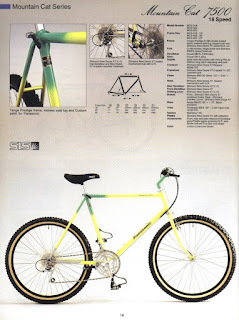 At some point along the way, Ken replaced the original stem with a nice Salsa roller-style model. Otherwise, the bike is in bone-stock-beater condition, sporting mostly period-correct XT components: a U-brake (under the stays), derailleurs, hubs, top-mount shifters, and cranks. I did put a NOS black Hyperlite bar on it, but only because old handlebars make me kinda nervous and I had the Hyperlite in my toolbox. I also installed a new no-logo, silver 1" Chris King 2Nut headset, but in this case I did so mostly because I had it just sitting in my toolbox, too, not because old headsets make me nervous or something. The Panasonic hangs on a special "hook" in the garage, set apart from the other "fun" bikes, waiting to be ridden... to work, around town, or on some errand. Over the years it's pulled our trail-a-bike and several different trailers, hauled tons of groceries, and transported long sticks of lumber and big bags of dogfood between here and there. For years, it's taken me to work whenever I needed it to, almost daily, always without fail, and often via the long-cut through the woods: rain, snow, or shine. It's a super-great bike, still brimming with utility, despite "the cancer" which appears to be growing within. 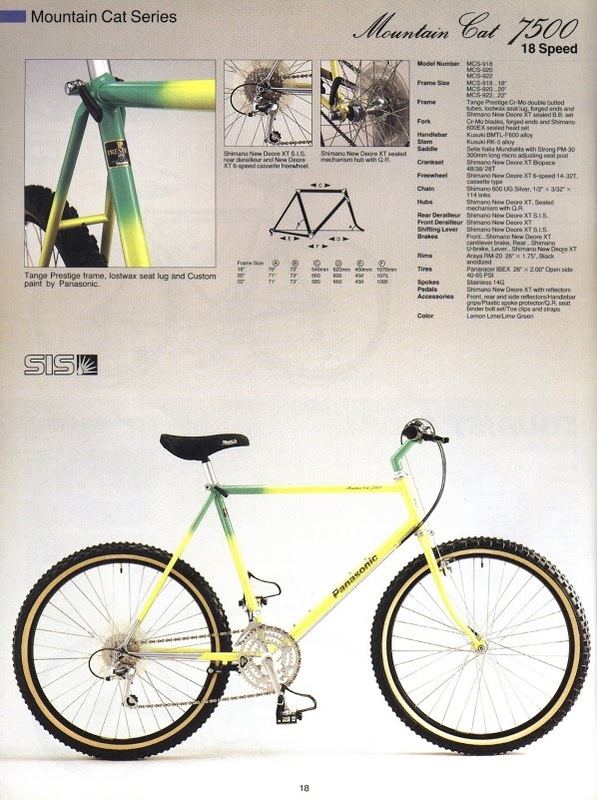 It's got serious style and harkens fondly back to a long-gone, bygone, exceptionally happy era in mountain biking, when bars were flat and narrow, brakes were cantilevered and often under the chainstays, top tubes were short, stems were long, gears were tall... and the woods were generally less crowded. All good stuff and worth recollecting, which I do, each and every time I ride it.